Fansipan (Vietnamese: Phan Xi Păng, listen) is a mountain in Vietnam. At 3,143 metres (10,312 ft), it is the highest mountain in the Indochinese Peninsula (comprising Vietnam, Laos, and Cambodia), hence its nickname "the Roof of Indochina". It is located in the Lào Cai Province of the Northwest region of Vietnam, 9 km southwest of Sa Pa Township in the Hoang Lien Son mountain range. The origin of the name Phan Xi Păng is unclear. The most accepted theory is that the name evolved from Hủa Xi Pan (the tottering giant rock) - the name that the locals called the mountain based on its shape. Another theory suggested that the name came from Hmong people as the name means Azalea Mountain in their language due to the prevalence of azalea and other species of Rhododendron genus on the mountain. It has also been suggested that the name could have derived from Phan Văn Sơn, a geography official in the Nguyen dynasty who helped the French to map the area and define the border with China in 1905. Due to the inaccurate local pronunciation, the name generally evolved into Phan Xi Păng. Fansipan is the tallest mountain in the Hoang Lien Son Range, situated on the border of Lao Cai Province and Lai Chau Province with its peak located on Lao Cai side. The mountain is part of the Hoàng Liên National Park. It has a topographic prominence of 1,613 metres (5,292 ft), ranking 6th in Vietnam. Fansipan was formed around 250-260 million years ago, between the Permian period in the Paleozoic era and the Triassic period in the Mesozoic era. The Himalayan orogeny since Late Meosozic has further uplifted Fansipan and the Hoang Lien Son Range and created the Red River Fault to the east. Currently, the mountain continues to be raised at a rate of 0.032 m (0.10 ft) a year. 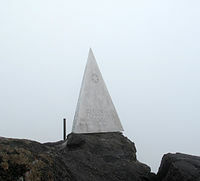 The initial metal pyramid was made and installed here by Soviet engineers from Hòa Bình in 1985. The amateur mountaineering expedition was the first one since the end of the colonial period and was officially timed to the 40th anniversary of the Victory Day of the Soviet Union over Nazi Germany. Fansipan can be climbed in a steep and fairly strenuous hike. Previously, it would take about 5-6 days from Sa Pa to reach Fansipan peak and return. Now the total time is usually only about 3 days, even 2 days, or for experts and strong, healthy people, it can be done in one day. Tour companies in the area will arrange hikes to the summit taking from one to three days. Most will recommend taking the two or three-day options and few guides will take tourists on a round trip in a single day. A very small village is located at around 1,500 m (4,920 ft) where accommodation and food is offered. Further up, at 2,800 m (9,190 ft), is an overnight camp. Most booked trips will include the use of these facilities in their price should they be required. A cable car to the peak of Fansipan was inaugurated on February 2, 2016. It departs from a terminal in Muong Hoa Valley near Sa Pa and takes 20 minutes to arrive at the summit. The service holds two Guinness World Records for the longest non-stop three-rope cable car in the world, spanning 6.3 km (3.9 mi), and the greatest elevation difference by a non-stop three-roped cable car for the 1,410 m (4,630 ft) difference in elevation between the termini. ^ a b c d "Southeast Asia" Ultra-Page Peaklist.org. Retrieved 2012-01-31. ^ a b ""Phanxipăng" thực chất là ... "Phan Văn Sơn"?". Giadinh.net (in Vietnamese). Retrieved 19 May 2018. ^ a b "Đỉnh Fansipan". Trung tâm Giáo dục Môi trường & Dịch vụ Môi trường Hoàng Liên (in Vietnamese). Hoang Lien National Park. Retrieved 20 May 2018. ^ "Đá đỉnh Fansipan "chợt già thêm" vài trăm triệu tuổi". Vietnam Union of Geological Sciences (in Vietnamese). Retrieved 20 May 2018. ^ Swatman, Rachel. "Longest non-stop three-rope cable car in the world opens in Vietnam". Guinness World Records. Retrieved 20 May 2018.